In 1736, Colonel Henry Ievers built Mount Ievers on the site of the old tower house at Ballyarrilla. The new house has been variously described as Pre-Palladian, Queen Anne and early Georgian. 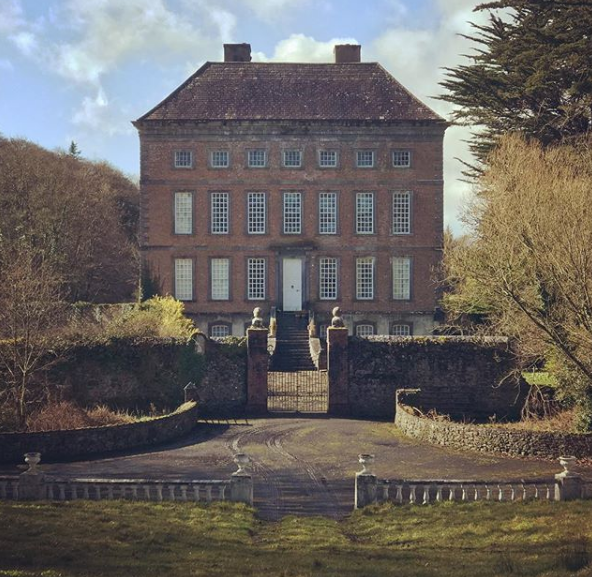 A few years later, Mark Bence Jones hailed it as ‘the most perfect and also probably the earliest of the tall Irish Houses’, possessed of ‘that dreamlike, melancholy air which all the best tall 18th century Irish houses have. It seems likely that John was either a son or brother of a Joseph Rotherey [sic] who was recorded as living beside Castletown House in County Kildare at the time of its building between 1722 and 1729. Indeed, it is likely that the Rotherys actually oversaw the work at Castletown as its Italian architect Alessandro Galilei is known to have left Ireland before building commenced. In this regard, it is notable that the original interior layout of Castletown owed much to recently published plans of English houses such as Chevening in Kent, with a central hall and saloon surrounded by four apartments on the ground floor and a gallery flanked by apartments on the piano nobile level. Indeed, Castletown shares a number of features with Mount Ievers including the two huge chimney stacks, the plain facade and the corner fireplaces. Mount Ievers is among the earliest and grandest of the tall Irish country houses, and was almost certainly inspired by the original 1679 drawings for Chevening, the old Lennard home in Kent which was sold to the Earl of Stanhope in 1717. 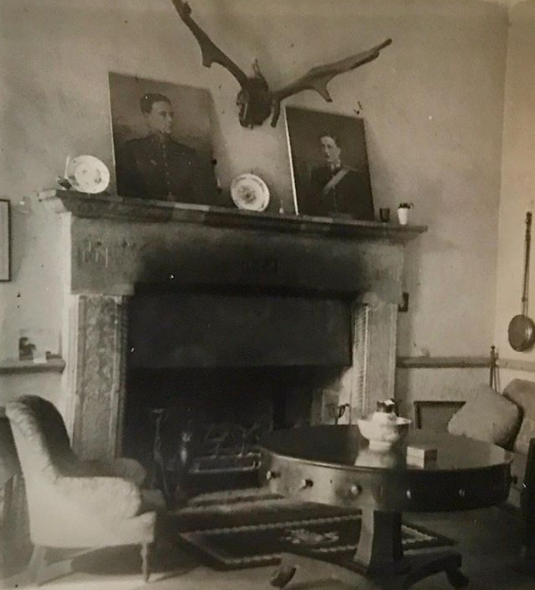 The fact that Sir Sampson Eure’s mother was a Lennard of Chevening has given rise to the theory that Henry Ivers, grandfather of the Colonel Henry Ievers who built Mount Ievers, was a close kinsman of Sir Sampson. The Galway town of Portumna, some 60m miles north-west of Mount Ievers, takes its name from the Irish ‘Port Omna’, meaning ‘the landing place of the oak’. It is certainly an apt name from Mount Ievers perspective because thirty four tons of oak used in the construction of the houses’ hipped roof came from the Earl of Clanricarde’s woods at Portumna. The timber was transported south by boat across the waters of Lough Derg to Kilalloe, from where it was carted a further 30km by road. One of the most prominent features of the house are the brick-vaulted ceilings which run over all the ground floor rooms. Eyre Hebert Ievers pointed out that these vaulted ceilings provided were secure from the three upper floors. ‘A single, small thick door with a hole for a musket shut off the narrow stairs giving the only access inside from the ground floor’, he wrote. ‘Both first floor entrance doors and thick, hung on enormous hinges, are furnished with massive locks, and there are slots in the walls at the sides to take a 6 inch by 4 inch beam across the back’. 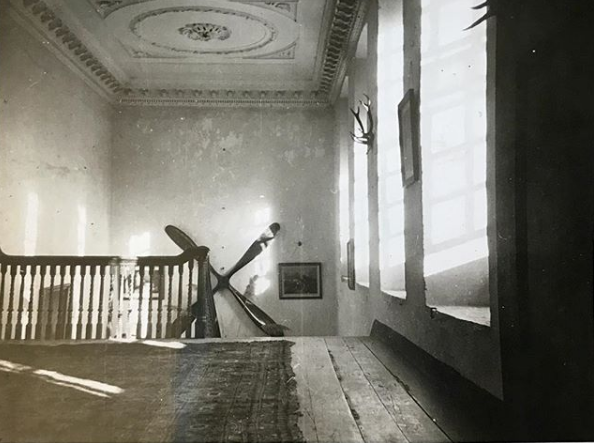 In 1937, The Irish Times noted that ‘the original brass locks are on all the doors on the first floor, and a number of the old window seats remain.’ The ceilings and cornices in the hall, staircase and upper hall are paneled in pre-Georgian style. A stone fireplace dated 1648 was salvaged from the nearby castle and re-erected in the hall of the house where it still stands. The walls are often four to five feet thick and, in several rooms, they are panelled in plaster, as opposed to wood. In the drawing room there is a beautiful fresco built into the wall which gives a panoramic view of the house, demesne and neighbourhood from about 1740. In the background of the painting one can see Bunratty Castle and the River Shannon beyond. North view of Mount Ievers, The Pink-Brick from Holland is extremely attractive on a Summer’s afternoon. 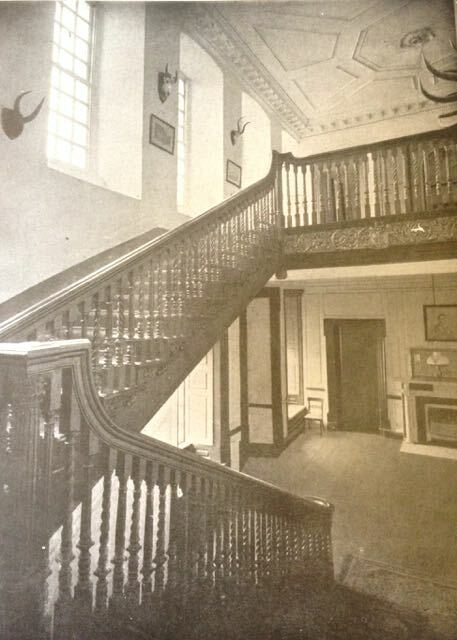 An old photo of the impressive Georgian staircase at Mount Ievers. The 1648 Fireplace which was salvaged from the old Tower house that stood on Mount Ievers site before construction. The top landing c. late 1940’s. The propeller was from Norman Lancelot Ievers stint as a pilot in the RAF and Battle of Britain. Notice the original timber floor from the 1730’s. 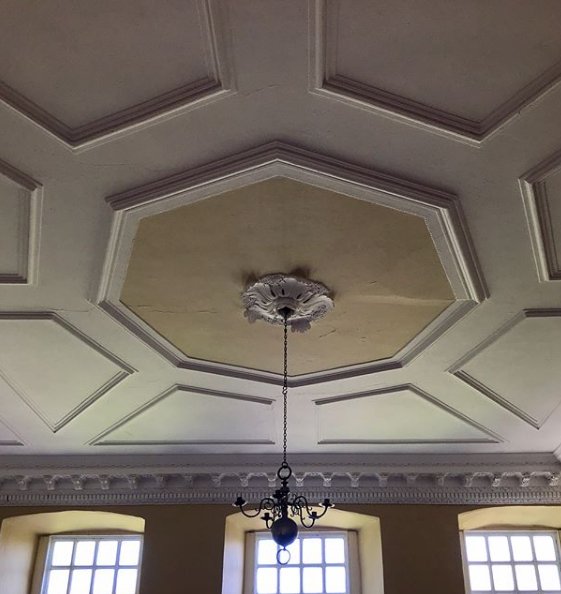 The ceiling of the 1st floor landing at Mount Ievers.